In a slight break from our usual style, I’ve actually stayed true to the medieval recipe, not adding the extra ingredients detailed in the book; the medieval recipe is just so quirky and specific that I wanted to try it as it was meant to be eaten. In the modern version, however, I’ve added in the carrots, bacon, and mushrooms to match the description. The medieval version is quite strange. However, take a delicious meat, and smother it with butter, and there’s only so much that time can alter. The spices are quite a bit sweeter than those in the modern version, and go well with the butter. The rye crust, we decided, is like many medieval crusts, and is meant more as a container than it is meant to be eaten. I’d be curious (and may try it at some point) just how long it would keep, as it is essentially potted venison in a pastry container. In contrast, the modern version is savory, bursting at the seams with venison, veg, and bacon. With such a variety of ingredients, each bite is different from the last in composition. The crust is wonderfully delicate and flaky, making it as enjoyable to eat as the filling. To be fair, though, this isn’t the best way to showcase venison, as it is just an element of the pie instead of the star of the dish. Also, rather than make a whole venison pie, we opted for this recipe to make several smaller hand pies. They might not fit in as well at a feast in Winterfell, but they’re ideal for snacks and lunches. The Winner? I’d give it to the modern pasties, but the old version is fun to try. Cook’s Notes: This recipe gave us a bit of trouble, but we persevered because it is such a strange and detailed description. In particular, the consistency of the pastry dough makes it difficult to seal well, if you plan to invert your pie as we did. Ours fell apart a bit when we took it out of the bowl, so the dough might need some tweaking to make it more durable. Put your venison in a bowl and cover with vinegar and wine; marinate overnight. Make your pastry dough by first rubbing in the butter to the flour, then adding the egg, and a bit of cold water at a time until it has a cohesive rollable consistency. This part is tricky. We didn’t have the right size pan, so we rolled out half the dough and carefully laid it in a grease ovenproof bowl. If you have a smaller-than-normal pie pan or springform pan, that should also work. Drain the venison and pat it dry. Sprinkle with spices and pepper. Using your hands, spread about 1 Tbs. butter on the inside of the shaped dough. Place 3 bay leaves on the bottom, then add the seasoned venison. Spread the remaining 1 Tbs. butter on top of the meat, followed by the other bay leaves. Roll out the other half of the dough, and cover the meat. Seal in whatever decorative way you like best. If using a pie pan (i.e. not planning to invert), cut a small hole in the middle of the top. When the pie is out of the oven, let cool completely in the fridge before inverting if taking that approach. Take a funnel and gradually pour your clarified butter into the hole in the top of the crust, stopping every so often to let it saturate the spaces between the meat. Learn how to clarify butter here. Makes about 10 hand pies. To make the pastry dough, mix the salt with the flour, and rub in the butter. Add the whole egg, and just enough cream to make the dough stick together. Set aside while you make the filling. In a large skillet, melt 3 Tbs. butter. Add all of the chopped vegetables and bacon and stir to ensure they are coated. Allow to cook for several minutes, then pour in the wine and cover. Simmer until the vegetables are soft. Remove from heat. Season the venison with salt, pepper, and savory, then toss with flour until all the pieces are covered. Brown the meat in another skillet, then add to the vegetables and bacon. Allow to cool until it can be handled. Roll out the pastry dough, and cut it into 6″ circles. Fill each circle with filling, being careful not to overfill such that the sides won’t meet. Brush the inside edges with some extra heavy cream, then fold the dough in half and press the seam shut. Crimp with a fork, and place on a baking sheet. Repeat until all dough and all filling is used up. Brush the pasties with cream. Bake for 20-30 minutes at 350F. I am always looking for ways to use venison … thanks for these recipes. Handpies are such an easy way to make a hot lunch that travels with you … as for all that clarified butter … I guess that’s one way to juice things up and keep the venison from drying up! 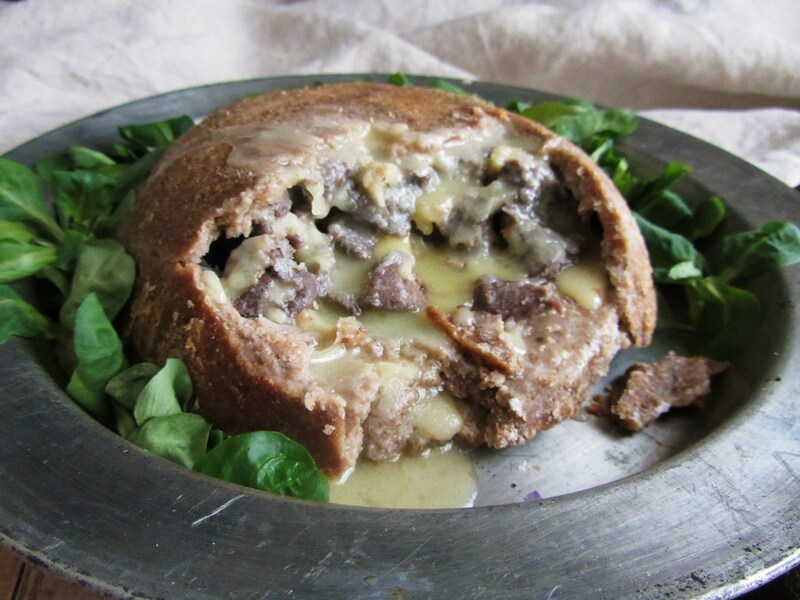 I love the look of the medieval venison pie. What does it mean to rub the butter into the flour? I’ve never made any kind of pastry dough before, so this term is unfamiliar to me. Sadie, rubbing the butter into the flour can mean literally that: putting the cold butter into the flour and rubbing it between your fingers until it’s incorporated into the flour and crumbly. You can also use a fork, or a pastry blender. A few pulses in a food processor will also work. What you want to be careful of is overworking the dough. Your hands shouldn’t be too warm when you do this and work quickly or your crust will be tough. Less is more when it comes to making crust. You want tiny chunks of butter throughout, rather than a paste. Ah, I see, thanks for the explanation. That’s actually what I would’ve guessed, as I’ve seen that done before. I’ve just never heard it described that way. The medieval pie looks fascinating — how did it taste with that much butter in it? I’m almost curious to see if would last the two to three months the original recipe said it would, too! It should seal the filling perfectly and is really edible. Also this kind of Rye dough based loaf is more kinf of pie/loaf that is meant to be medieval full meal to take with you when you go and do your days work. But well being Finn that is just my opinion about rye dough and how to make loaf/pie with it. About how much wine did you use? I don’t see a measurement for that. Thanks! Whoops! I’m not sure how much I used, but I’d say pour in roughly around a cup of wine, or until it’s halfway up the veggies. So, what *is* the next way to showcase venison? Is there an example on your site? The trick for a pastie dough like this is that for the longer storage you -want- to overwork the dough a bit. It needs that extra gluten development to be durable.